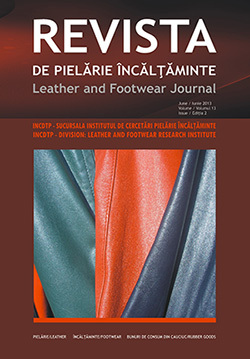 Revista de Pielarie Incaltaminte (Leather and Footwear Journal) is published by INCDTP - Division: Leather and Footwear Research Institute, Bucharest, Romania, at CERTEX Publishing House, which is acknowledged by CNCSIS (The National University Research Council). The journal is coordinated by an Editorial Board consisting of national and international recognized specialists, researchers, professors, and experts from governmental organizations. The articles are scientifically revised by two national and international experts in the field, from research institutes or universities. - issues related to polymers used for footwear sole manufacturing. The articles are currently published in English and contain abstracts and key words in English, Romanian and French. The journal contains original research papers followed by scientific, technical, economic and statistic information, reviews of local and foreign conferences / congresses / symposiums, with the purpose of stimulating the dissemination of research results in these fields. The journal is distributed in national and international institutes, universities, libraries and SMEs. By submitting your manuscript to be considered for publishing in Leather and Footwear Journal you are giving consent to processing personal data for administration and publication purposes.